One of the most challenging transitions into a keto diet or low-carb diet is keeping your sweet tooth under control. That’s where fat bombs will come in to save you. Fat bombs come in all different flavors, shapes, and sizes, including dairy-free and nut-free options. These no-bake fat bombs aren’t just gluten-free and high fat — they’re also ready in just 20 minutes. But the best part about these “peanut butter” fat bombs? They don’t actually contain peanut butter. That’s right — most peanut butter contains inflammatory compounds like sugar and hydrogenated oils that can sabotage your health goals. Unless you have the highest-quality organic peanut butter, it’s best to stick to more nutritious nut butters like macadamia butter or almond butter. So next time you have a craving for ice cream covered in melted chocolate, maple syrup, and chocolate chips, remember this recipe exists and is very keto-friendly, ringing in with only 1.4 net carbs and tons of healthy fats. MCT fatty acids or medium chain triglycerides are a mainstay of most healthy keto diets. Mostly because these fats are converted quickly to energy instead of being stored in your body as fat. They also help improve blood sugar levels, which can help lower inflammation and help you lose weight[*]. Healthy weight loss and blood sugar balance is a great idea for cardiovascular health. Whey is another ingredient in these fat bombs that may support heart health. Whey may help to improve blood pressure, lower triglycerides, and improve insulin sensitivity and blood sugar levels. Overall, whey protein is an excellent addition to your diet and may reduce your risks of cardiac complications[*][*][*]. Coconut oil is rich in saturated fats that may help you manage cholesterol levels. Specific fatty acids found in coconut oil may help increase your HDL “good” cholesterol levels and also reduces LDL and triglyceride levels[*][*]. Your heart is a big fan of cocoa powder, as numerous studies have shown the vast array of benefits of cocoa for your heart. Some of the ways it supports your cardiovascular system include lowering blood pressure, reducing LDL levels, decreasing your risks of heart attack and stroke, and improving overall heart health and circulation[*][*][*]. A dash of cinnamon goes a long way for your heart health as well. Cinnamon may help reduce blood pressure, regulate cholesterol levels, support blood sugar levels, improve blood coagulation, and overall reduce risks of stroke and heart disease[*][*][*][*]. MCTs may also support healthy brain function and mental clarity. Multiple studies have shown that MCTs can significantly improve overall brain function and even help prevent Alzheimer’s disease[*][*][*]. Considering the complexity of the human brain, it’s no surprise that it requires many essential nutrients to function correctly. Serotonin is a vital neurotransmitter that helps with concentration and balanced moods[*]. Increasing your levels of an amino acid called tryptophan can help boost serotonin levels, leading to better brain function. And you can find tryptophan via a compound called alpha-lactalbumin in whey protein[*][*]. Cocoa powder has loads of antioxidants, which stimulate the body and the brain. Antioxidants can help support neurotransmitter production, which can help improve your mood and boost overall brain health and focus[*]. MCTs also support gut health by strengthening your gut lining and promoting the growth of healthy bacteria needed for proper nutrient absorption and detox[*]. Whey protein is another keto-friendly supplement that may help repair and maintain the sensitive tissue that lines your gut. Some studies even suggest that whey can help heal disease like Crohn’s — an inflammatory bowel disease[*]. Coconut oil contains lauric acid, a fatty acid that’s been shown to combat microbial infections. One in vitro study tested coconut oil against candida, a harmful fungus commonly found in the digestive tract, to see if it’s antifungal properties were a match for this bacteria. The researchers reported that coconut oil was successful against fungal infections, and recommended it as a part of candida treatment[*]. What could be better than a quick snack to keep you fueled? You can make these peanut butter fat bombs with high-quality, organic peanut butter or use Perfect Keto Nut Butter, which is packed with MCTs and delicious macadamia nuts and vanilla. It’s the perfect recipe to add to your ketogenic diet and a great way to satisfy your sweet tooth. The best part? You’re only three simple steps away from taking a bite of the best fat bomb you’ve ever tasted. Just gather all your ingredients, get a large bowl and mixing utensil, a muffin pan, some muffin liners, and you’re all set. 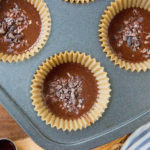 Mix all the ingredients until everything is well-combined, add the liners to the muffin pan, and gently pour the mixture into each little muffin cup. Place the pan in the freezer for about 30 minutes or until you’re ready for a snack. Allow the fat bomb to sit at room temperature for a minute or two and then enjoy! Pro tip: Add this to your list of fat bomb recipes and make a couple of batches during your next meal prep so you can have these low-carb keto peanut butter fat bombs all week long. Whenever those afternoon snack cravings hit to avoid the potato chips and reach for these delicious, bite-sized Nut Butter Fat Bombs. They’re the perfect treat! Fill muffin pan with liners, pour the mixture into liners, and add cacao nibs if desired. Place pan in the freezer to chill for 15 minutes or until ready to be served. Allow to sit for a couple of minutes to thaw before eating.